Our product range includes a wide range of container & pallet dollies. Whatever types of your Container & Pallet, NANDAN has always a container Container & Pallet Dollies available for your airport, Nandan provides container and pallet dollies that are used for the airline container and pallet movement. LD3 and LD6 as well as pallets from P1 to P6 can be loaded. We also have the 20 feet version available for our clients. The trolley is shotblasted and painted with polyurethane paints in any RAL colour of your choice & provided with a MAE standard towing hook and a parking brake which has been integrated with the tow bar. It can also be galvanized if needed. 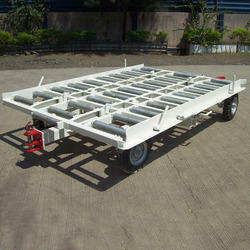 Under the guidance of our expert team, our company offers wide range of Dollies to our valuable clients. They are acclaimed for the features like stainless steel hardware, sealed bearings and balanced galvanized rollers. Our company makes pallets and containers that are rugged and reliable. The Dollies are designed so that they can stand the atmospheric abuse. Furthermore, these are available at reasonable prices.